Automatic transmission fluid (ATF) is the fluid used in vehicles with self shifting or automatic transmissions. 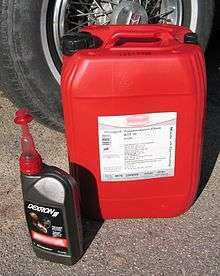 It is typically coloured red or green to distinguish it from motor oil and other fluids in the vehicle. Modern ATF typically contains a wide variety of chemical compounds intended to provide the required properties of a particular ATF specification. Most ATFs contain some combination of additives that improve lubricating qualities, such as anti-wear additives, rust and corrosion inhibitors, detergents, dispersants and surfactants (which protect and clean metal surfaces); kinematic viscosity and viscosity index improvers and modifiers, seal swell additives and agents (which extend the rotational speed range and temperature range of the additives' application); anti-foam additives and anti-oxidation compounds to inhibit oxidation and "boil-off" (which extends the life of the additives' application); cold-flow improvers, high-temperature thickeners, gasket conditioners, pour point depressant and petroleum dye. All ATFs contain friction modifiers, except for those ATFs specified for some Ford transmissions and the John Deere J-21A specification; the Ford ESP (or ESW) - M2C-33 F specification Type F ATF (Ford-O-Matic) and Ford ESP (or ESW) - M2C-33 G specification Type G ATF (1980s Ford Europe and Japan) specifically excludes the addition of friction modifiers. According to the same oil distributor, the M2C-33 G specification requires fluids which provide improved shear resistance and oxidation protection, better low-temperature fluidity, better EP (extreme pressure) properties and additional seal tests over and above M2C-33 F quality fluids. There are many specifications for ATF, such as the DEXRON and MERCON series, and the vehicle manufacturer will identify the ATF specification appropriate for each vehicle. The vehicle's owner's manual will typically list the ATF specification(s) that are recommended by the manufacturer. Automatic transmission fluids have many performance-enhancing chemicals added to the fluid to meet the demands of each transmission. Some ATF specifications are open to competing brands, such as the common DEXRON specification, where different manufacturers use different chemicals to meet the same performance specification. These products are sold under license from the OEM responsible for establishing the specification. Some vehicle manufacturers will require "genuine" or Original Equipment Manufacturer (OEM) ATF. Most ATF formulations are open 3rd party licensing, and certification by the automobile manufacturer. Dexron III/Mercon - Most 1980s and 1990s GM and Ford, Mercury, Lincoln, many Asian vehicles, some Asian power steering fluid applications, some Ford/Mazda manual transmissions. It is generally less expensive than Dexron VI/Mercon V.
Dexron VI - Most GM and pre-2004 Toyota products, some Ford applications, replaces Dexron III in GM products. Mazda M5 (MV) fluid - For the Mazda FN4A-EL/Ford 4F27E and Mazda FS5A-EL/Ford FNR5. Also sold as Ford FNR5 fluid. Genuine Mazda M5 is made by Idemitsu Corporation, available as Idemitsu Type-M. This fluid is NOT Mercon V.
The use of a lint free white rag to wipe the dipstick on automatic transmissions is advised so that the color of the fluid can be checked. Dark brown or black ATF can be an indicator of a transmission problem, vehicle abuse, or fluid that has far exceeded its useful life. 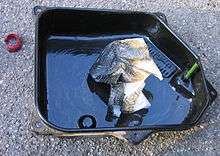 Over-used ATF often has reduced lubrication properties and abrasive friction materials (from clutches and brake bands) suspended in it; failure to replace such fluid will accelerate transmission wear and could eventually ruin an otherwise healthy transmission. However color alone is not a completely reliable indication of the service life of ATF as most ATF products will darken with use. The manufacturer's recommended service interval is a more reliable measure of ATF life. In the absence of service or repair records, fluid color is a common means of gauging ATF service life. ↑ "ATF | Mobil 1™ Synthetic ATF". www.mobiloil.com. Retrieved 20 August 2014. ↑ "Archived copy". Archived from the original on 2012-04-19. Retrieved 2012-04-18. ↑ "Chrysler LLC ATF+4Ž Info Center". Centerforqa.com. Archived from the original on 2012-03-01. Retrieved 2012-02-28. ↑ "Ford Motorcraft Automatic Transmission Fluid Chart" (PDF). Ford Motor Company. Retrieved 2016-10-14. ↑ Turbo hydramatic 350 By Ron Sessions, page 20. ↑ "A brief history of automatic transmission service fluid" Revised and effective 1 January 1999 Ford Motor. ↑ "Archived copy". Archived from the original on 2014-10-06. Retrieved 2012-04-22.